...the JANUARY Block! Ooh, ahhh, I know you're blown away by my naming creativity right now. 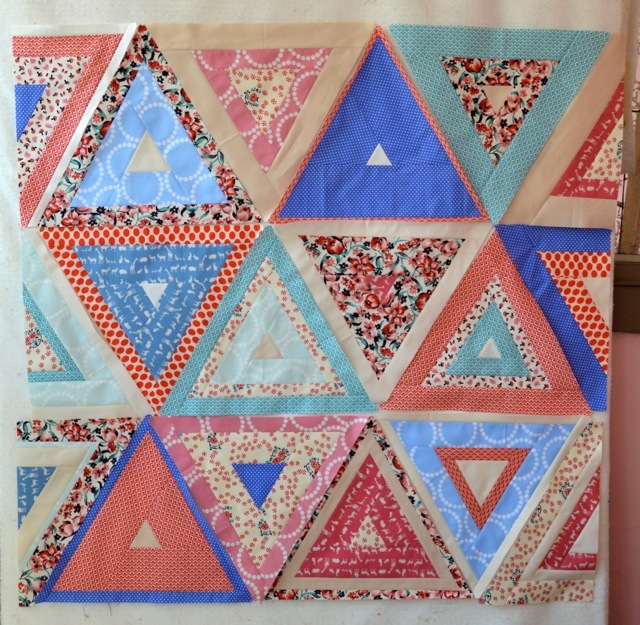 This block is made using templates and for all of you who are curve-phobic, I can assure you, it's much easier than it looks. These curves are all nice and gentle which makes them easy to put together. You can do it! The patterns for these blocks will be sent to members of the LAMQG in our monthly newsletter but I've got good news for all of you non-members! 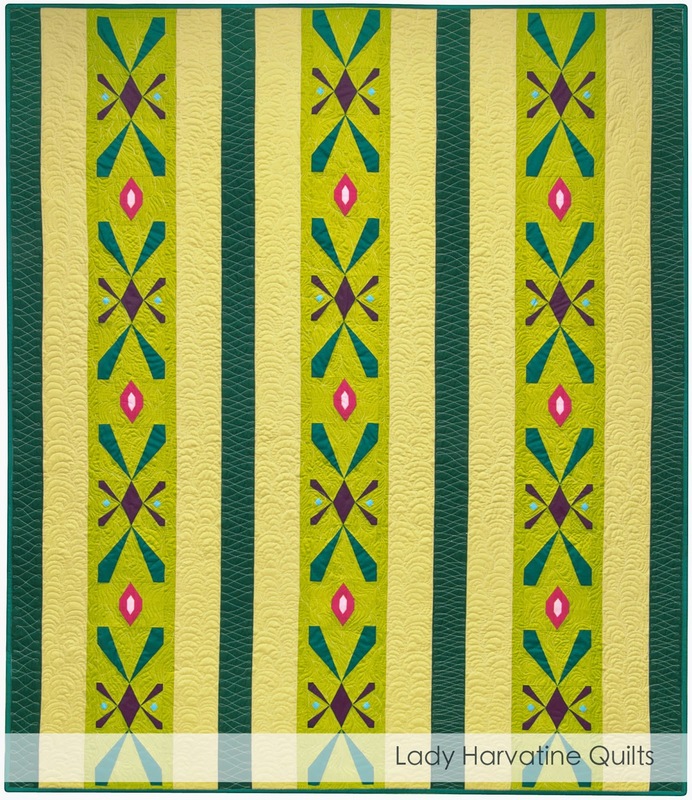 My block pattern will be for sale in my shop for anyone else who wants it! 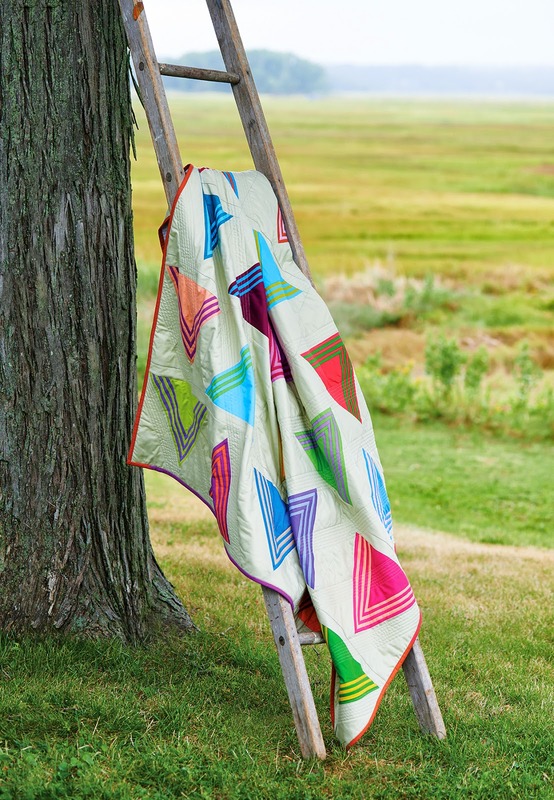 Even better news, since the pattern is just for a block and doesn't include instructions for a finished quilt it's available for half the price of my regular patterns! 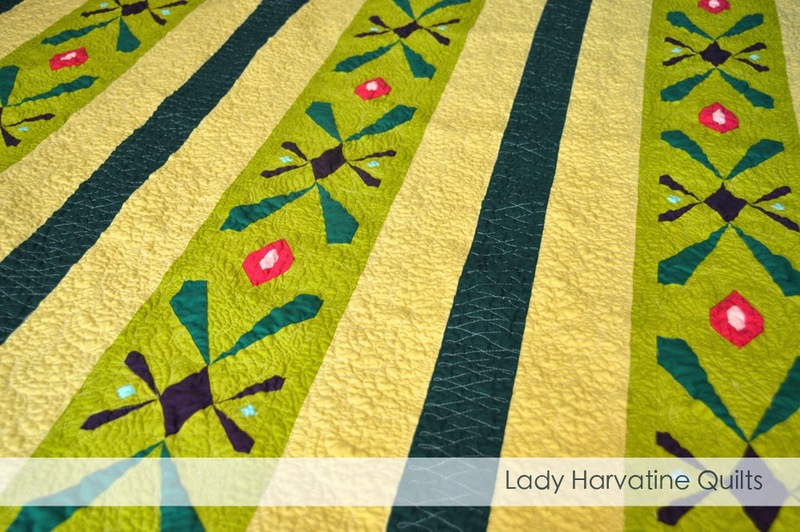 If you're interested, head on over to the Lady Harvatine Shop! If you want to keep an eye out for cuter BOM patterns, follow @lamqg on Instagram. 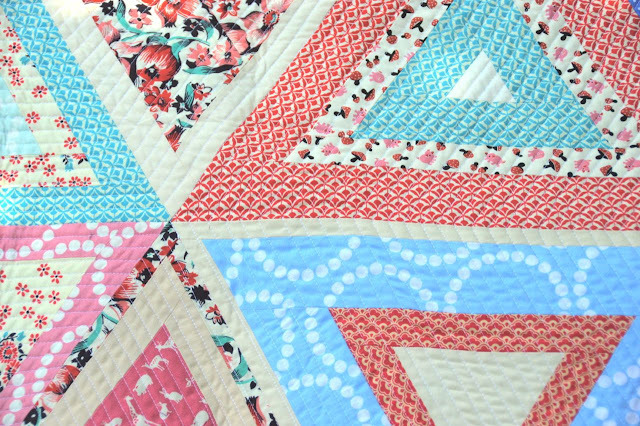 I don't know if all of the blocks will be available to non-members, that will be left up to each designer, but they will make for some great eye candy either way! Here's where I show you a million pictures of my cute kids. "You don't want to be Pink Minnie?" Ginny is more than happy for me to sew during the day if I am making something for her. I told her I would try to finish it after she went to bed and we woke to her crying the next day, trying to get into my sewing room and yelling "I want my dess! I want my dess!" Needless to say, she's wanted to wear it everyday since. Both of these are Simplicity patterns though I don't have the numbers on hand. Ginny's was made exactly like the pattern. Teddy's was more for toddlers so I took in the smallest size. I also adjusted the placement of the ears a bit, made the ear linings smaller, added the tuft of hair and the little pads to the bottom of his feet. I also attached the feet to the onesie instead of having separate booties. Ginny loved trick-or-treating. Teddy was happy to go along for the ride and was asleep by the time we got home. Gin proceeded to sample a little bit of a lot of candy. As you can see she really lived it up. Harv already owned all of his costume. And last (maybe least? ), I was Kid Sister in white overalls and a white visor that I found at the thrift store and dyed pink. I was surprised by how many people remembered My Buddy but had never heard of Kid Sister! Though we never had either, they definitely have equal billing in my memory (as do their jingles). A disparate group for sure. Maybe next year we'll do a family costume but I have a feeling if we do it will have to revolve around Gin's whims. She's a pretty opinionated little girl. Here it is! My finished Log Pyramid baby quilt. 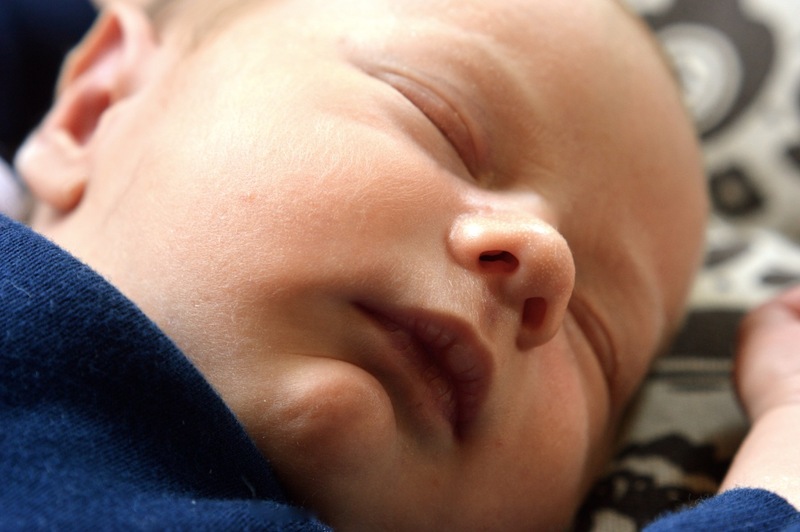 Soon it will be off to live with a sweet little newborn girl. It's quite different from my original which used mostly solids. The key to using mostly prints like this is to keep any similarly colored and similarly scaled prints from being right next to each other. I kind of blew it on one pyramid. Can you spot it? The center triangle is a little too hard to distinguish from the row around it. Now who wants to gaze upon my lovely points? By carefully trimming and lining up your pieces you too can have pretty points. You have the power! And here's my crazy, scrappy back. I do get satisfaction from making my backings out of leftovers from the top. Waste not, want not, use every part of the buffalo, etc. There you have it! I hope you've enjoyed playing along and if you haven't yet, you can join in at any time. 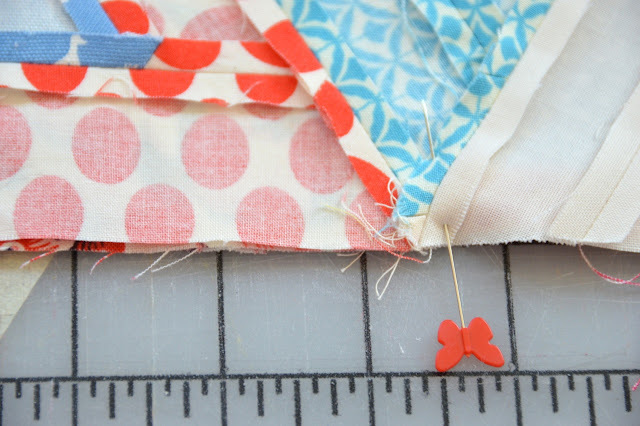 It's one inch wide and I don't want you to have to do the math on how to make inch wide binding if you don't want to. 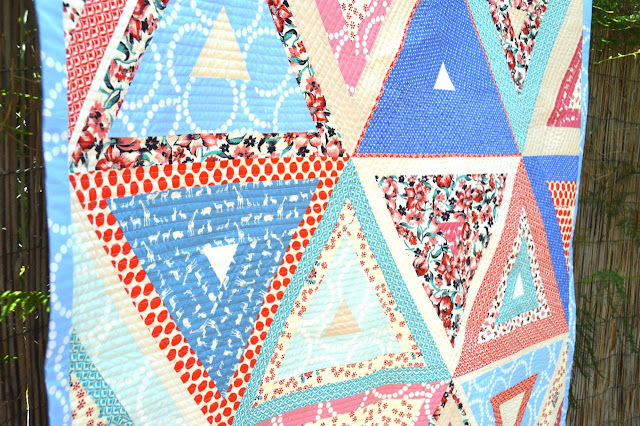 The edges of the quilt are trimmed differently to avoid covering up chunks of your pyramids with binding. 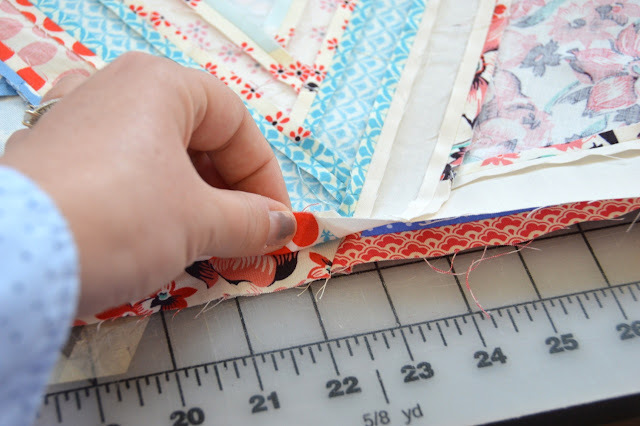 First you need to cut your binding. The strips should be 6.25" wide by the width of your fabric. Not sure how to calculate how many strips you need? Figure out the perimeter of your quilt by adding the width to the height and multiplying that number by two. Add twelve (to give yourself some wiggle room) and then divide by 40. You'll probably get a decimal so round your answer up to the next whole number. That is the number of strips you need. Cut your strips, sew them together end to end, right sides facing and press your seams open. 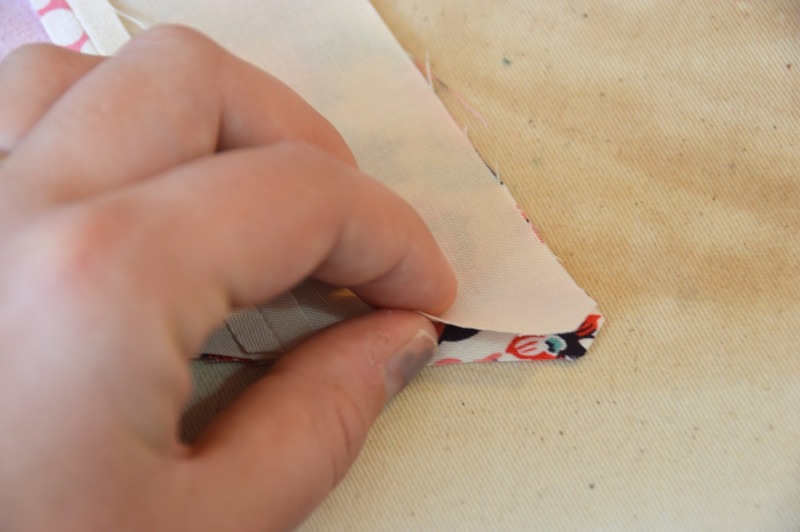 Press the entire length of binding in half, wrong sides together as in the photo below. Now you need to trim your quilt edges. On the top and bottom edges do not trim at the edge of the quilt top. This is very very important. If you do, the tips of your pyramids will all be lopped off and you will be sad. Instead, trim 3/4" from the edge of the quilt top. Trimming the top edge of the quilt. 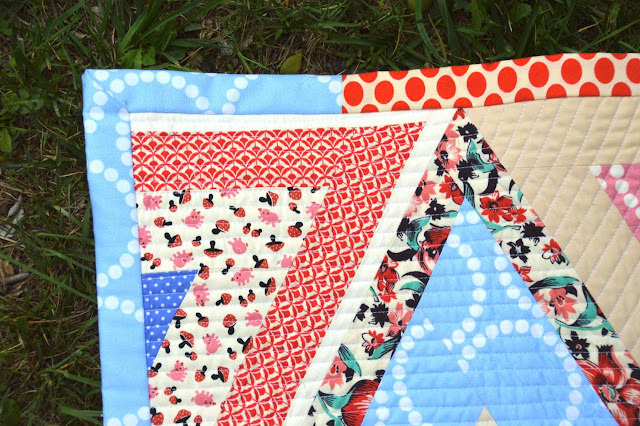 For the left and right sides of the quilt you can trim like normal, along the edges of the quilt top. This is because we took the extra wide binding into account when we made our side blocks. 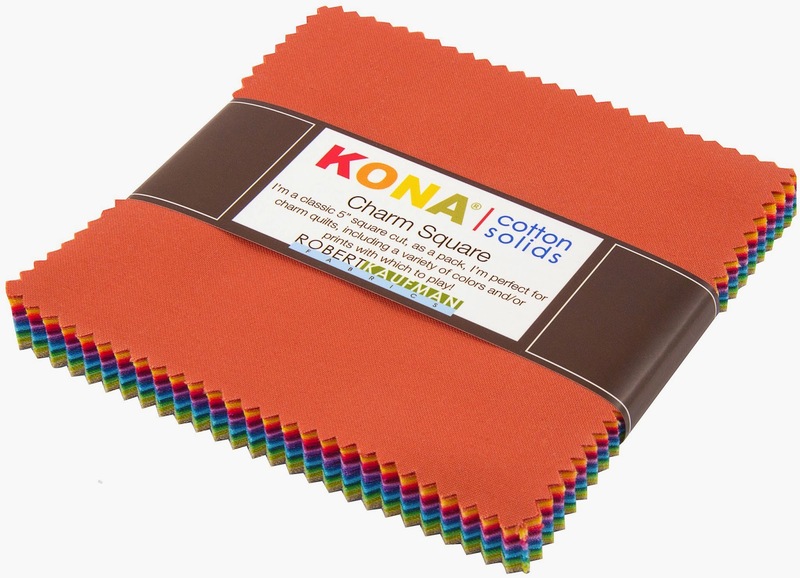 They've got and extra 3/4" of padding that can be covered up without deforming any pyramids. Trimming the right side of the quilt. And now, to sew the binding on. 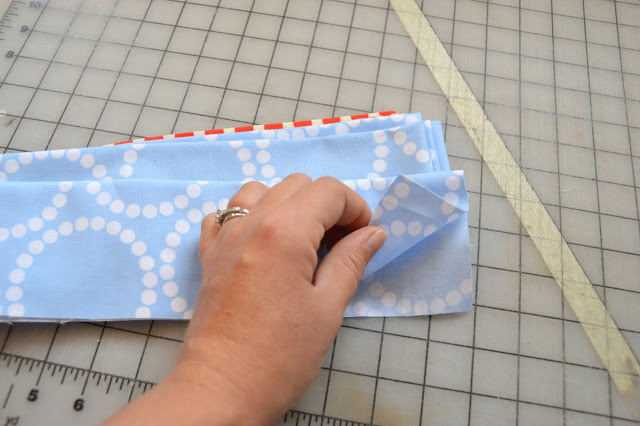 You will sew with a 1" seam. I pulled out the handy screw on seam guide that came with my machine to keep my seams nice and straight. Apply your binding just like you normally would and hand stitch it to the back. And there you have it! 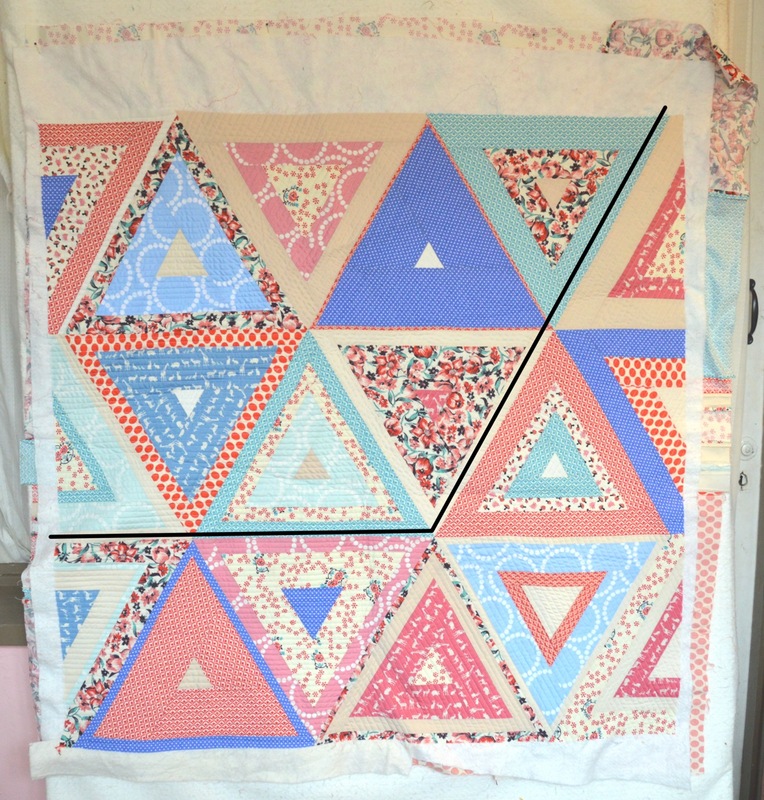 A lovely extra wide binding on your lovely finished quilt! 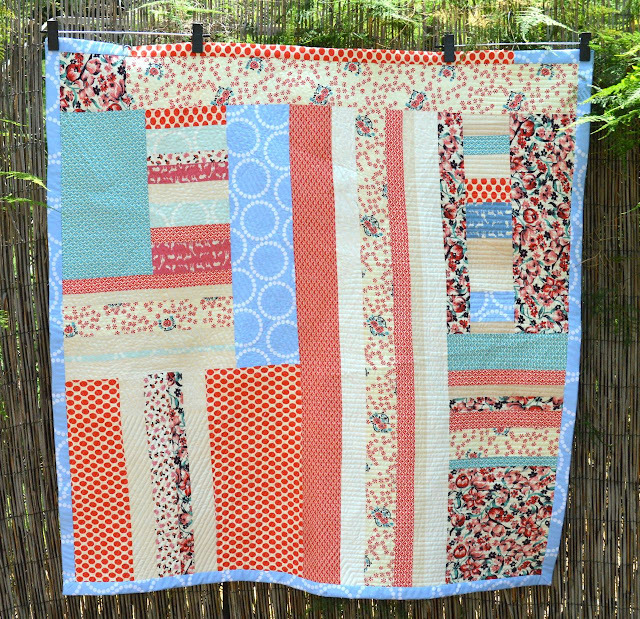 Since I don't want to bury the lede, I will be back on Monday with a whole mess of beauty shots of my finished quilt. Hi internet, can you tell I've been busy? Little Teddy was born last Monday, at home like his big sister. Mommy and baby are doing very well. This guy is quite a bit easier than his sister was, so far at least. Here's hoping he can keep it up and let mommy get some sewing done this summer! I sincerely apologize for dropping the ball on the final installment of the Log Pyramid Quilt Along. The binding post will be coming very soon! Ok, I lied. I'm going to break the ending up into two posts. 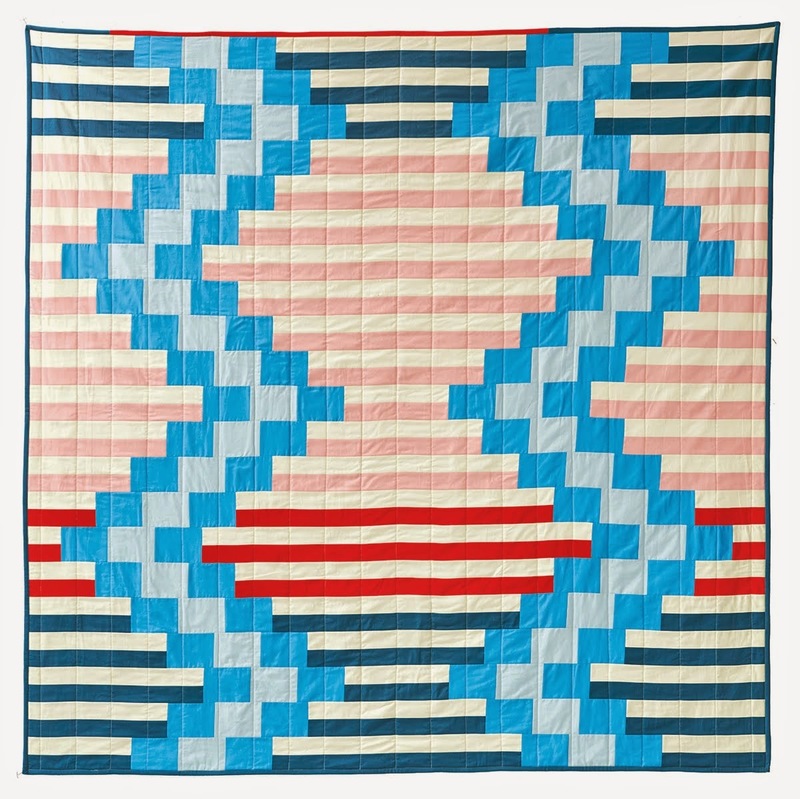 So today we'll quilt and next Wednesday we'll bind and be done! 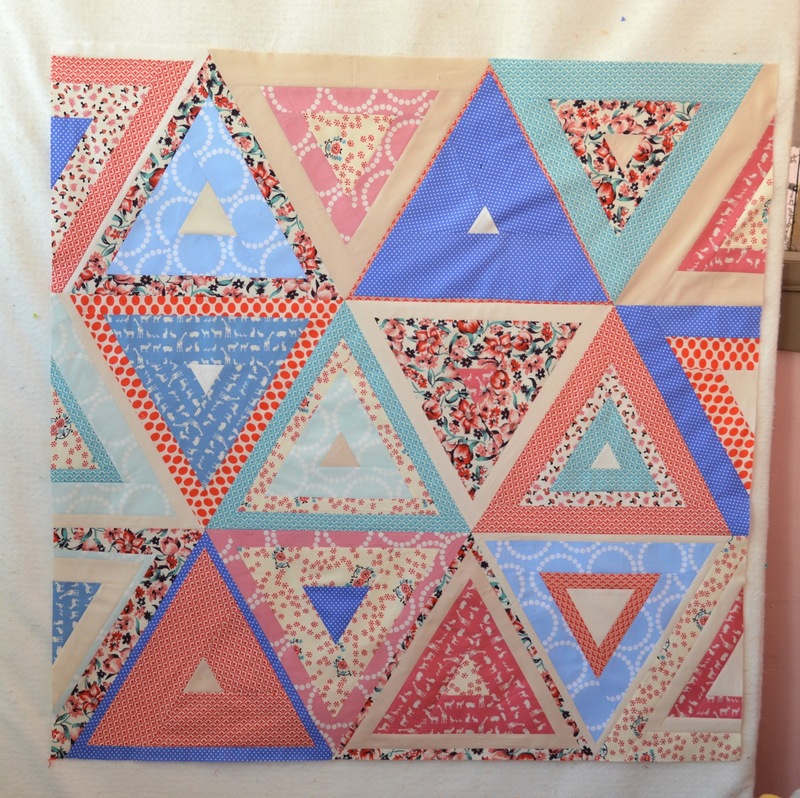 To start, pick a point where six pyramids meet, somewhere in the middle of your quilt. 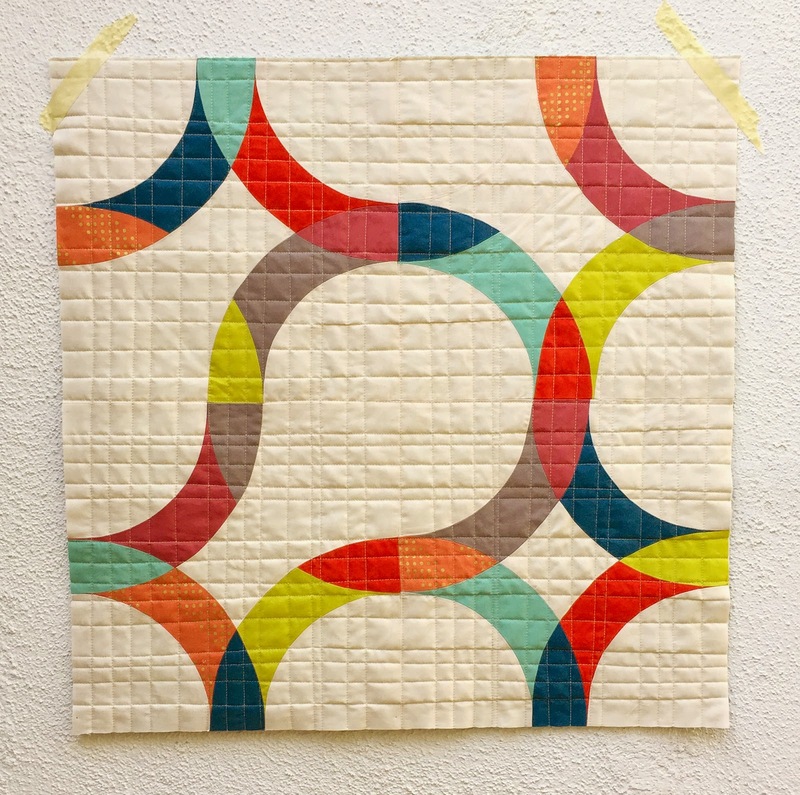 With a walking foot, you're going to quilt one third of this intersection. Use the edge of your foot and the seam as a guide. 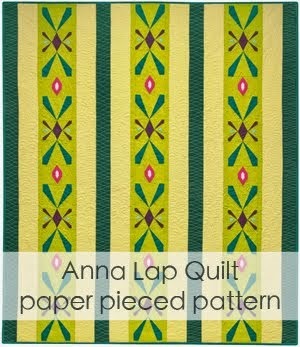 The line below indicates where I started quilting. I followed the seam down from the top right corner until I reached the seam at the center of this third. 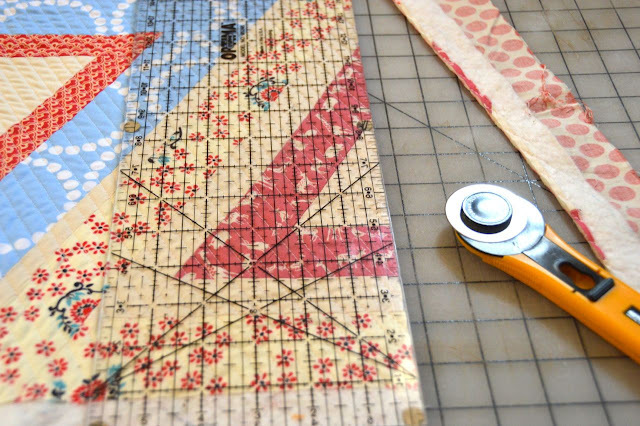 With the needle down, lift your presser foot and rotate the quilt to follow the next leg. Now you can go back to where you started and use your first line of quilting as a guide and fill in the rest of this "third". When you reach an area where your quilting line is close to another seam, you can use that as an opportunity to straighten your quilting. You're going to get off a little bit, that's okay. You'll have lots of chances to gradually straighten things out. When all three sections are complete I choose to stitch in the ditch just on those three legs that you used as your initial guides. It won't make much of a difference on the front of the quilt it will keep you from having a gap in the quilting when you look at the back. We're in the home stretch! 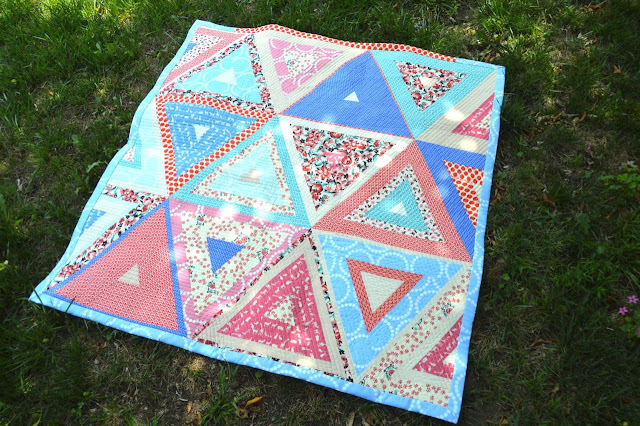 Remember, if you're making your own log pyramid quilt, add photos to the Flickr group! It is currently very sad and underpopulated and it needs you! My typical approach to making quilt backs is to use what I have, preferably leftover from the quilt top, to just get it done. 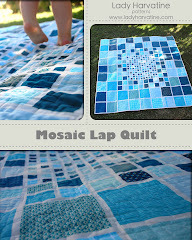 I don't like waste and I'm also usually pretty anxious to get a quilt finished by the time I get to the back. 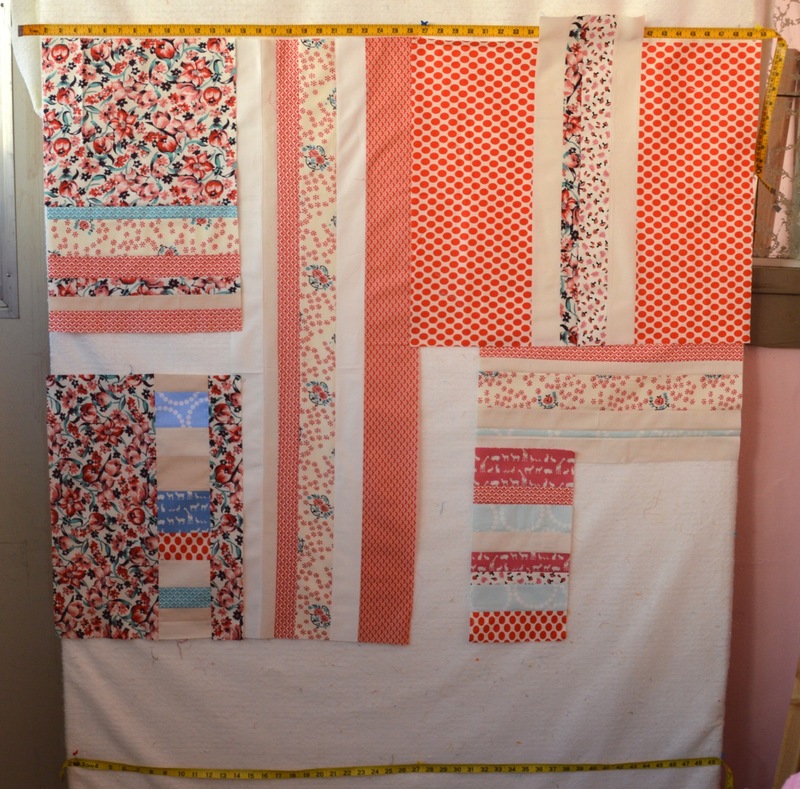 After finishing this quilt I was left with a pile of unused strips of various lengths. 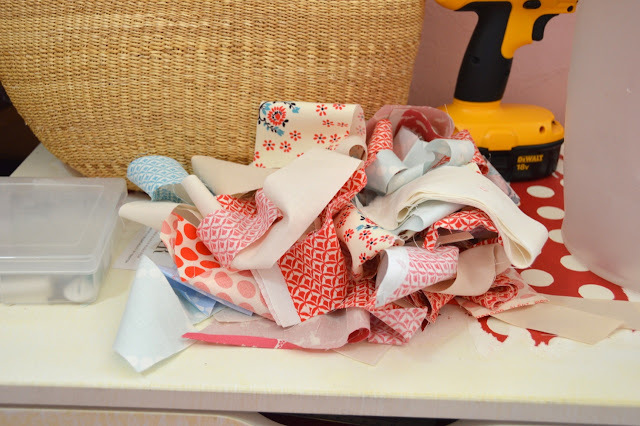 I sorted them by length and sewed each group together then trimmed. I ended up with the pieced sections you see below. 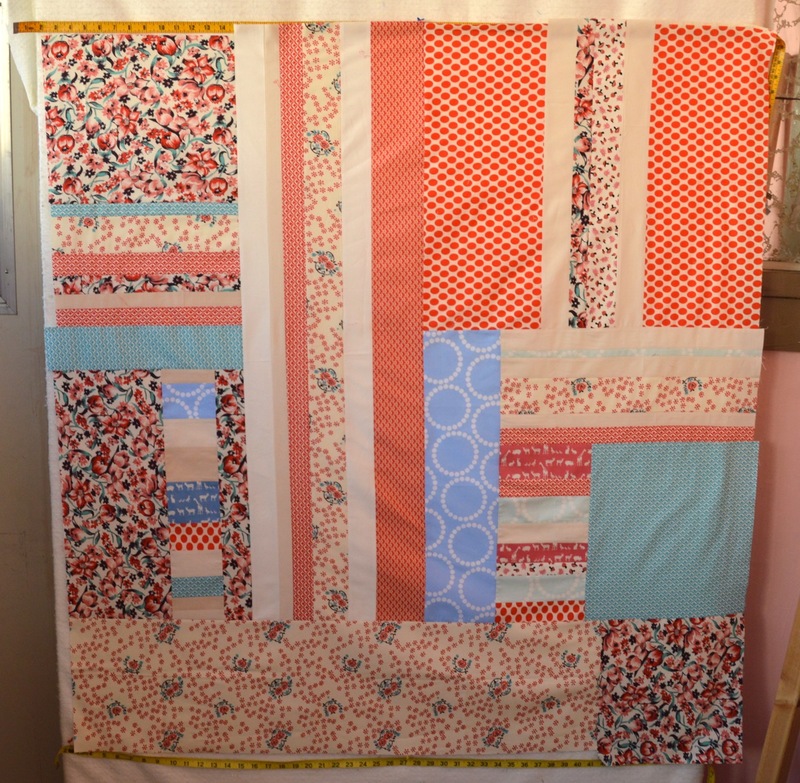 I then laid them out on my design wall to then figure out what size pieces I needed to fill in the gaps. 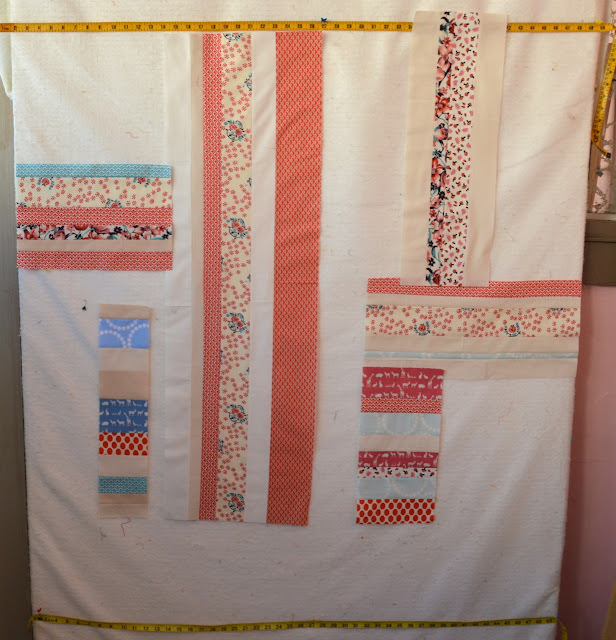 You can see that I pinned two tape measures to the wall to indicate how tall the back needed to be (the width of the wall was the same as the width I needed for the back). You could do the same thing with masking tape or painter's tape. 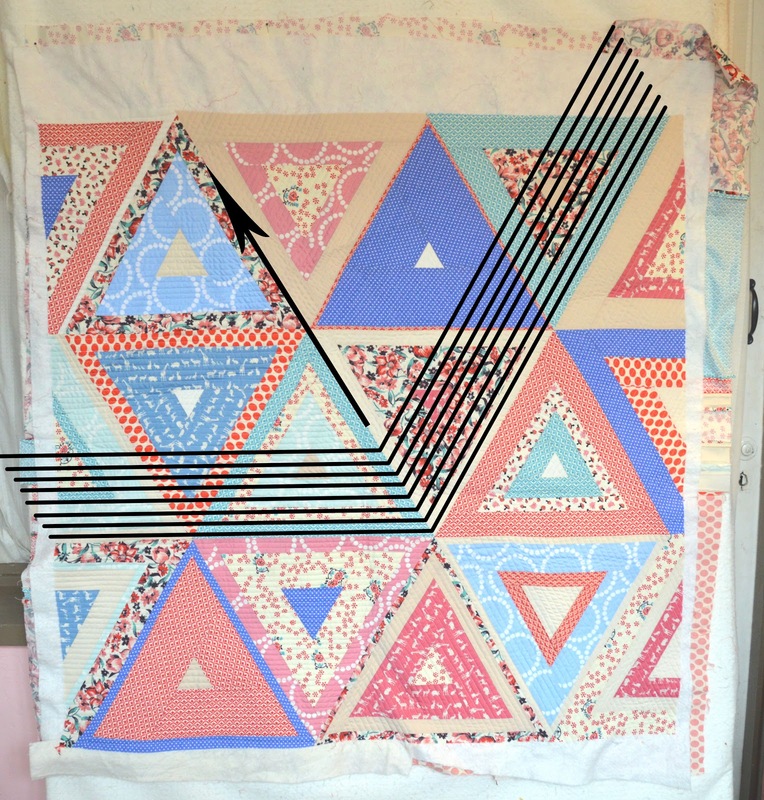 ***IMPORTANT*** In addition to the extra height and width you would normally add to a quilt back (typically two inches greater than the quilt top on all sides) you need to add another two inches to the height. 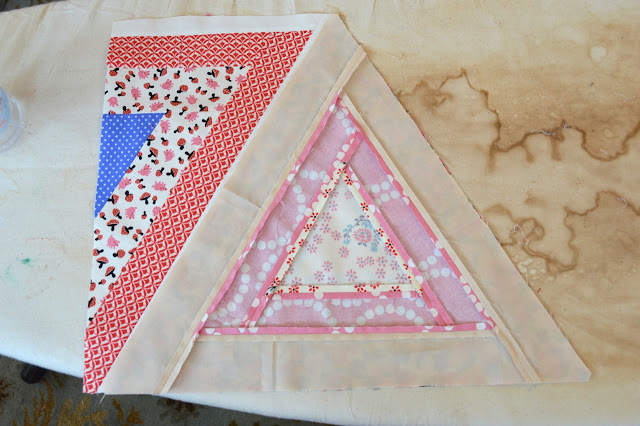 This is to allow for the extra wide binding without covering up a big chunk of your pyramids. 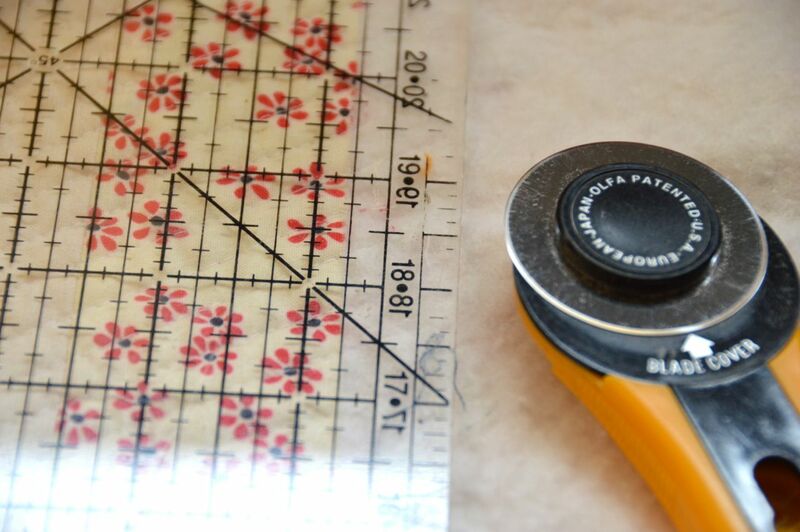 To fill in the blank spaces, measure the hole you want to fill and add seam allowance. 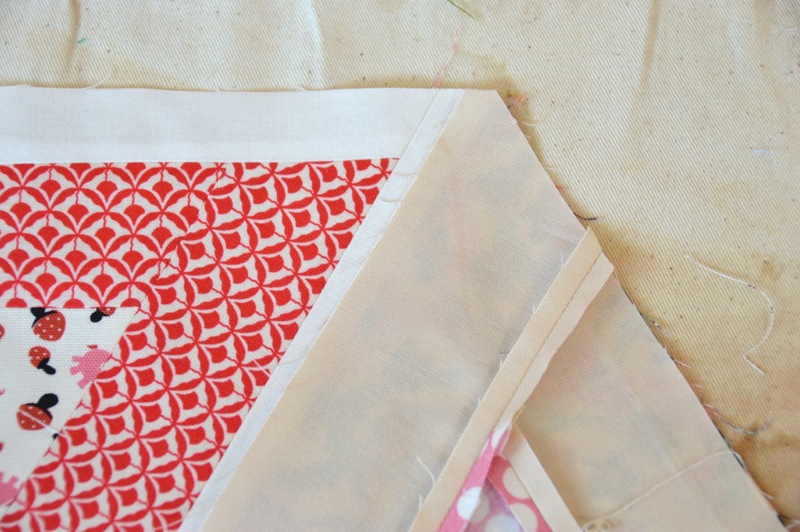 Add fabric to the smaller sections and as they get bigger, sew the larger pieces together like a puzzle. I added the top left square first, then sewed the two pieces on either side of the top right strips, then did the same with the bottom left strips. After the below photo was taken, I added a strip between the two pieces on the left and could then sew it to the long strip down the middle. Just remember not to sew anything together that is only a partial seam. And here it is all filled in. I used all fabric that I had left over from the top. 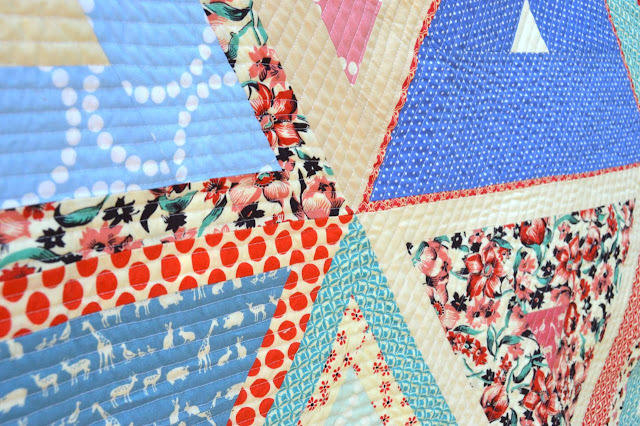 Before we get to the stitching I wanted to let you know there's now an official Log Pyramid Quilt Along Flickr group! 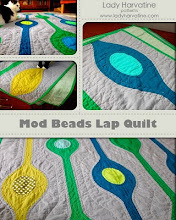 Find it here and share what you're making! 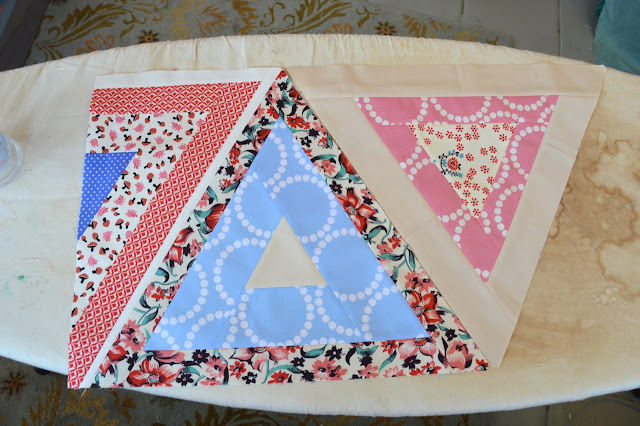 Now comes the easy part, sewing the blocks together. Starting with the top row, you can see in the photo below I've already sewn the first two blocks together. I then grab the next in line off the wall and lay them out side by side to make sure it's oriented correctly. Then flip the new block over onto the old one. Because of the handy little blunt corners on the template, you don't have to worry about lining the blocks up correctly. The top corner of the new block should line up with the top edge of the row exactly. And the bottom two corners match up as well. 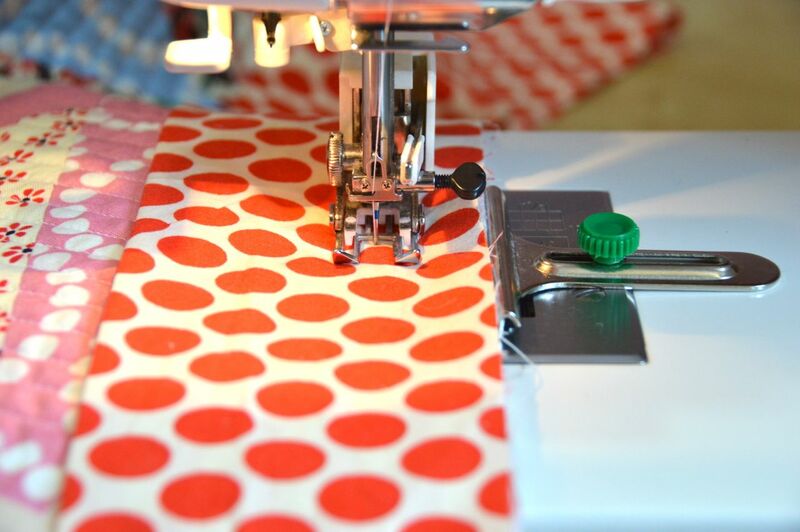 To sew the rows together you just need to take a little peek to make sure your points line up. It's a good idea to put a pin at each point. Remember that you're working with fabric and it's okay if things aren't exactly even. 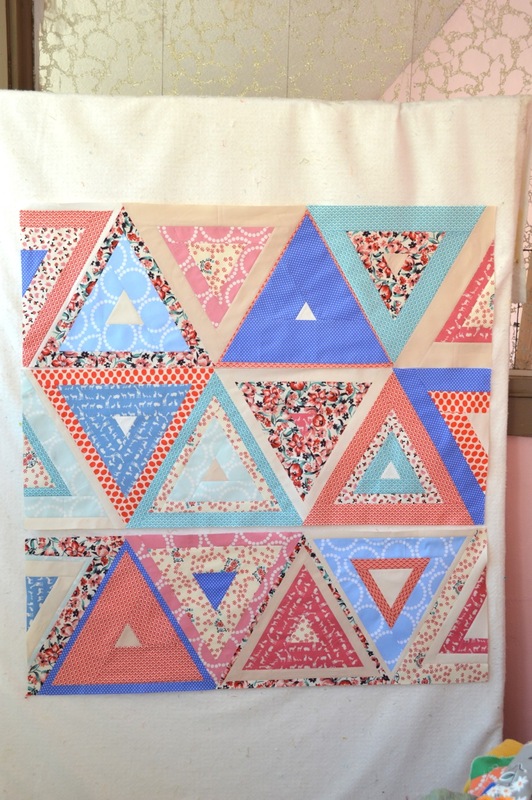 Just pin all of your triangle points and don't be afraid to give a little tug when you're sewing to even things out. And there you have it! Next week I'm going to wrap this baby up!